Exploring youth culture in art is tricky. The kids and trends age rapidly, but a cultural work preserves a moment in history. In their own time, the characters of Degrassi Junior High looked like regular teenagers, but over the nearly 30 years since it went off the air, those kids have curdled into camp icons, wearing tie-dye shirts and acid wash jeans for all eternity. To sort ephemeral fads from more enduring themes, it helps to compare works against each other, observing the various cultural eras like geological strata. By comparing Degrassi Junior High against Degrassi: The Next Generation, for example, you can see that while fashions change, teenage pregnancy is eternal. In 2000, Sega released Jet Set Radio (or Jet Grind Radio, as it was originally titled in North America) for the Dreamcast. It follows the GGs, a gang of roller-blading, graffiti-spraying vandals—“rudies” in the game’s parlance—as they clash with rival gangs over territory. Eight years later, Square Enix released The World Ends With You for the Nintendo DS, the story of a grouchy teenager named Neku Sakuraba who is forced to team up with his fellow teens to win a series of challenges or be killed. Both of these titles are set in vaguely fictionalized versions of Shibuya, a popular neighborhood in Tokyo and one of the youth culture capitals of the world, and both of them are love letters to the bleeding edge at the time of their release. If we wanted to understand how youth culture grew and changed in the first decade of the 21st century, we couldn’t find a better pair of games to compare than these two. Jet Set Radio’s vision of youth culture in 2000 is of a carefree wonderland. The GGs are a meritocracy, granting admission to any applicant who can perform a sufficiently radical trick. They’re sexually and racially diverse, and members of various subcultures and even rival gangs integrate into the group peacefully. The rudies are competing street gangs, but their turf war is depicted as a bloodless game of graffiti king of the hill. The real antagonists are not the rival gangs but a corporate cult and the overzealous police force, organizations fronted by middle-age men. Once the true villains show their faces, the rudies quit fighting one another. When the police clamp down on the rudies with attack dogs, nerve gas, and tanks, it’s a blown-up vision of the “Skateboarding is not a crime!” persecution complex from the late ’90s and early ’00s. The game presents conflicts between kids as harmless saber rattling and suggests that in the face of outside threats, a group of teens with disparate backgrounds could band together to fight against oppression and corruption with the power of free expression through guerilla art. Just eight years later, The World Ends With You depicts the adolescents of Shibuya as engaged in borderline civil war. Instead of the antagonists being adult authority figures, the game’s villainous Reapers are fellow teenagers. 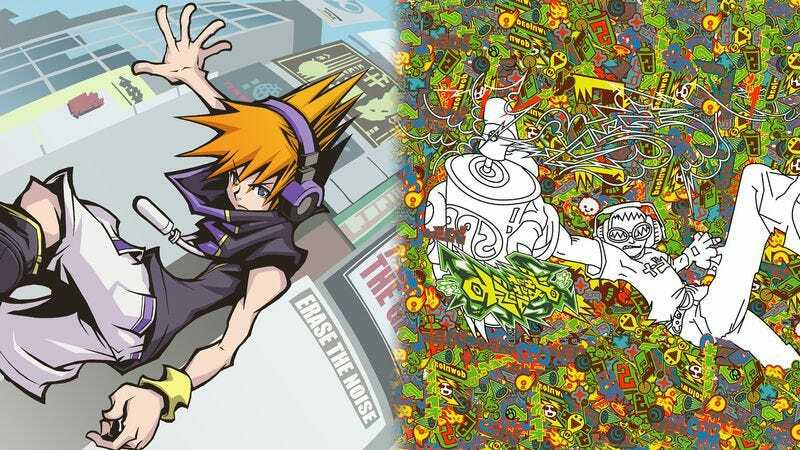 Name-brand clothing and pins are the game’s equivalent of armor and weapons, so where the rudies used art and self-expression to battle evil, Neku and friends need to indulge in their consumerist urges and practice brand loyalty in order to survive. The kids of 2008 are also deeply insecure: In World, each character has a bravery rating that locks them out of wearing anything that would draw too much attention for their fragile egos to handle. In the 2000 game, the biggest threats are oppression and harassment from authority figures. In the 2008 game, bullying and toxicity threaten to destroy the culture from within. The kids of World are placed in a direct competition that can only have one winner, forcing them to view each other as threats. They also have to contend with the Reapers, older teenage enforcers who target players for sport. In World’s vision of Shibuya, kids their own age are a threat, and the older kids are a source of fear and persecution instead of guidance and support. Worst of all, as far as the kids are concerned, the stakes in 2008 were higher than ever. In Jet Set Radio, exaggerated violence was a threat in every stage, but the consequences of failure were downplayed. When a character drops to zero health, no matter how violent the downfall may be, it just results in some foot-stomping with an “aw, shucks!” animation. In The World Ends With You, though, the threat of annihilation hangs over Neku’s every action. If Neku loses all his health, he reacts with an agonized shriek, not mild disappointment. In 2000, kids could bounce back from an air-to-surface missile attack ready to dust themselves off and try again, but their 2008 equivalents were so anxious, judgmental, and insecure that pairing the wrong shoes with the wrong shirt could literally mean the difference between life and death. Yet the kids of 2000 and 2008 both draw strength from their superficially dissimilar youth cultures. The GGs lived in a time when free expression and acceptance were the norm, allowing them to take down a corrupt corporate psychopath with nothing but magnetic Rollerblades and a few cans of spray paint. Neku’s peers have been trained to see each other as rivals, but he is still only able to defeat the game’s 26-year-old final boss by calling on the power of his new friends. His era’s obsession with brand-name clothing gives his threads and pins an outsized strength, which he needs to keep himself and his partners alive. The values are different, but the underlying message is still that music, style, art, and relationships are what allow young people to stay strong in the face of adversity, no matter where that adversity comes from.